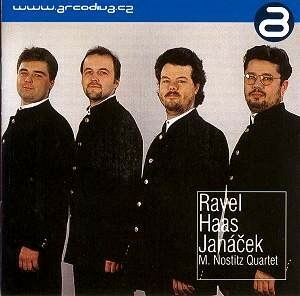 Ravel / Haas / Janáček - Leoš Janáček - Mediální ohlasy - ArcoDiva management - Hudební agentura - Hudební agentura ARCO DIVA Management s.r.o. In case you were wondering, the quartet’s fuller name is the Mathilda Nostitz. It was named after a distinguished member of a famous family whose patronage in the eighteenth and nineteenth centuries was generous and wide-ranging. It seems to survive on the first initial in its documentation. Naturally Czech and Slovak music fans will look to the Ravel and make disappointed noises about the missing native quartet – there is no shortage – but others may well reflect on the parallels, implied because the booklet never spells them out, between the Ravel and the Janáček. It actually makes for a programme of stylistic and actual historical lineage, Haas famously having studied under Janáček in Brno. The Moravian master’s First Quartet is youthfully projected, more so than by those old masters the Smetana in either their 1965 stereo recording (now on Testament) or their 1976 Supraphon disc. Incidentally we should be wary here of absolutes; whilst the nature of their interpretation, its colouristic and expressive slant, didn’t much change there were subtle, though slight, differences in tempo. They tightened up over that decade and there is a very slight increase in tension in these two recordings. The M Nostitz are less the personalised tonalists naturally – there are very few Jíři Nováks or Milan Škampas around these days – but they play with flair and commitment. This can occasionally lead them astray, and I felt in the second movement they were trying to project too much, the rhythms sounding over–processed and not quite natural. Others may well disagree but those unison passages are slightly too hard. As for the finale, well, the M Nostitz have a point of view and I respect it. This is avuncular and extrovert playing but I do miss the noble pain in Jíři Novák’s tone and Škampa’s unrivalled genius in the viola part, that internal, troubled spirit that in the newcomer’s hands is rather public.